Anthropogenic disturbances resulting from human land use affect forest landscapes over a range of spatial and temporal scales, with diverse influences on vegetation patterns and dynamics. These processes fall within the scope of the coupled human and natural systems (CHANS) concept, which has emerged as an important framework for understanding the reciprocal interactions and feedbacks that connect human activities and ecosystem responses. Spatial simulation modeling of forest landscape change is an important technique for exploring the dynamics of CHANS over large areas and long time periods. Landscape models for simulating interactions between human activities and forest landscape dynamics can be grouped into two main categories. 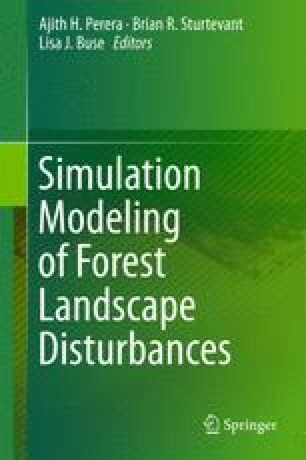 Forest landscape models (FLMs) focus on landscapes where forests are the dominant land cover and simulate succession and natural disturbances along with forest management activities. In contrast, land change models (LCMs) simulate mosaics of different land cover and land use classes that include forests in addition to other land uses such as developed areas and agricultural lands. There are also several examples of coupled models that combine elements of FLMs and LCMs. These integrated models are particularly useful for simulating human–natural interactions in landscapes where human settlement and agriculture are expanding into forested areas. Despite important differences in spatial scale and disciplinary scope, FLMs and LCMs have many commonalities in conceptual design and technical implementation that can facilitate continued integration. The ultimate goal will be to implement forest landscape disturbance modeling in a CHANS framework that recognizes the contextual effects of regional land use and other human activities on the forest ecosystem while capturing the reciprocal influences of forests and their disturbances on the broader land use mosaic.